I love bacon and anytime I can cook with it I do. I know, yell at me now but I only use organic bacon. Now I’ve made Gluten Free Jalapeno Poppers before, but never without dairy. Well when I opened Ree Drummond’s new cookbook The Pioneer Woman Cooks and saw BBQ Jalapeño Poppers, I knew I had to get busy adapting her recipe so I could eat it. First let me talk about this new cookbook. It is beautiful. 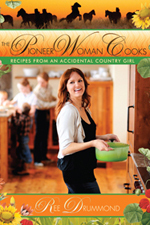 If you have not checked out her website, The Pioneer Woman, go there first. Then you’ll want to pick up her cookbook. In The New York Times Dining section this week they described her book as “a portrait of a real American family kitchen”. Throughout the book you get a glimpse into life on a cattle ranch, her family and the food from her kitchen. I was fortunate enough to meet Ree and hear her talk at the BlogHer Food Conference in September. She is just as down to earth in person as she comes across in her cookbook. Now the recipes are not gluten free or dairy free so you will need to adapt them, but I think you will enjoy them. If you have questions about changing up ingredients, just drop me a note. Her recipe for the poppers is the first recipe in her cookbook. I can’t wait to get busy on making more. 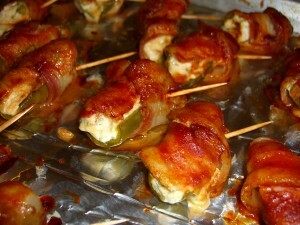 So, now on to my version of BBQ Jalapeño Poppers. I’d like to thank Alisa Fleming from One Frugal Foodie and author of Go Dairy Free the book and the website. She gave me the heads up on Tofutti Better than Cream Cheese. I was looking for a good non-dairy substitute that was gluten free, non-hydrogenerated and didn’t taste like a foam cushion. So I bought a container and I have to admit, I didn’t taste it until the poppers where cooked. I was a little nervous and didn’t want to know if it tasted bad before it was cooked. Well let me say, the BBQ Jalapeño Poppers tasted amazing. They are so full of flavor and gluten and dairy free. I’m in love. I also made this recipe with pablano peppers for a mild version. You can eat just one of those for a whole meal! Now the filling for Ree’s BBQ Jalapeño Poppers was cream cheese, cheddar cheese and green onions. I added a little more to the cream cheese mix. You can really add whatever you like to the mix. I’m also going to take Ree’s dare of putting two of these on my hamburger. She warns of instant addiction and you know what, I bet she’s right. I’m going to give that a try today with my leftover BBQ Burgers (ground beef mixed with BBQ sauce). Update: This was submitted to What Can I Eat That’s Gluten Free and Slightly Indulgent Tuesdays. On to my version of Gluten and Dairy Free BBQ Jalapeño Poppers! Preheat your oven to 275 degrees. No that is not a typo. 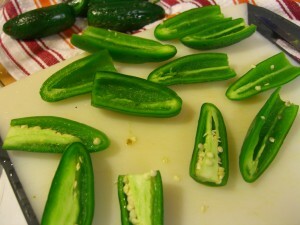 Carefully slice your jalapeño peppers in half and remove the seeds and membrane. 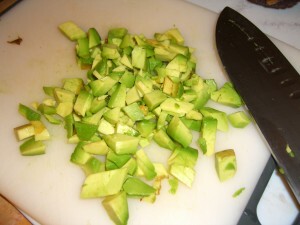 You can use a knife or spoon and you may want to even wear gloves to keep the hot oils off your hands. If you don’t, make sure you get that oil off of your hands before you do anything else. If you would accidentally touch your nose, eye or anywhere else on your body, it will burn like the dickens. Run you hands under cold water, smacking them back and forth. Then you can use some soap just for good measure, again with the cold water. 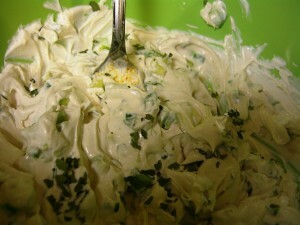 Mix together the cream cheese, green onions, seasonings, and avocado. Spoon or using a tiny spatula, add the mix onto each jalapeño and pablano pepper. 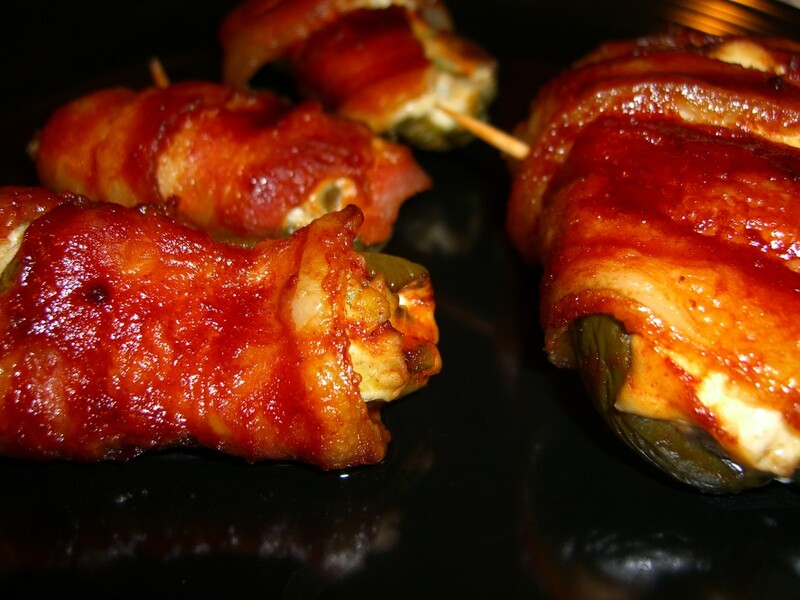 Now you want to take your bacon and wrap it around the pepper. Brush on the BBQ sauce and then secure the bacon onto the pepper with a toothpick. Cook in the oven for 1 hour. This temperature and timing is how Ree cooked hers. I thought at first that can’t be right but you know it worked perfectly. That hour of cooking gave me time to get the rest of the meal ready. I won’t lie, this takes time to put together. But it is so worth it. My mouth is watering now just writing about them. I’m going to take the rest and freeze them for the next football game and these will definitely be at my Super Bowl Party. 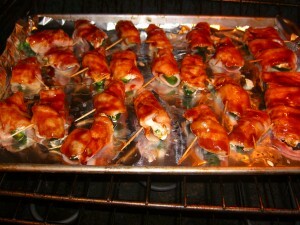 I also think next time I make these I will make a double batch so I have more leftover for later. They are that good! You can use any type of cream cheese and add in any other hard cheese to that mix you like. If you want different flavors, change up what you mix into the cheese and the type of BBQ sauce you use. If you like it hot, leave in some of the membrane on the peppers. Warning, I did that and when I say hot, I mean hot. If you want to make these but you want a lower heat or not heat at all, try using a long red sweet pepper, red, orange or yellow bell pepper cut into quarters or the pablano and cubanella peppers that are mild. You can always check the scoville scale or heat level of peppers. If you can’t find organic produce, try for local and if that’s not available get what is. Note: I like strong flavors and the amount of cumin and cilantro did not stand out as strongly as I would like so I would add just a little more. You should adjust to the flavors to what you like. These sound fantastic! I love reading Ree's blog – How fun that must have been to meet her =D. Lauren- Ree is an amazing person with all she does. Amazes me. I'm having fun adapting her recipes to gluten and dairy free. Ooooooo, just when I was looking for a gluten free treat to take to a new social media group potluck, you come along with this one. I think I even have some avocados hanging around. I love Ree too, so glad her book is out now. Oh man, these look amazing!!!!!! WOW! This recipe looks fantastic. I can't wait to try it! Jessica- Let me know if you give it a try. Great appetizers for Thanksgiving to keep people out of the kitchen. Great adaptation for gluten free! Bacon, onions, cheese, bbq sauce, how can you go wrong with that? Notice I didn't mention the peppers :). It sounds great. Thanks for linking to "What can I eat that's gluten free?" Linda- If you don't like the heat, take all of the seeds and the white membrane out and you will just have a nice flavor, not the heat. You could also do this with a few other veggies if you just won't try any peppers. You are just too creative! Those look great. Alisa- These little poppers were really good. Thanks for the tip on the cream cheese. Still want to check out the cashew cream. I am always impressed with your ability to take anything and make it fit your needs. These look delish! Thanks for linking to Slightly Indulgent Tuesday! Heat free Jalapenos. They are called Fooled You.